Become a Data Deposit Box reseller and earn 25%+ per month. Our flexible programs (agent, reseller, white label) allow you to choose your branding, marketing, billing and support options. By partnering with Data Deposit Box, you’ll be providing your customers with a world-class solution that’s easy to use, reliable, secure and guaranteed to work – or your money back! Our flexible partner program supports a broad continuum of partnerships; from agent to reseller to white label wholesaler. So whether you’re a 1 person IT shop, or a 100 person MSP, Data Deposit Box has a partnership program designed to fit your needs and provide you with a steady, passive income stream that just keeps growing. Our standard partnership starts at 25% commission. You earn 25% every month, on everything we bill your clients, for as long as we’re billing them and they’re paying us. If you choose to whitelabel, you’re free to markup our price as much as you want, and earn even more. 200+ partners and 350,000+ users trust Data Deposit Box to secure their valuable data. Our customers include top brands, entrepreneurs, doctors, dentists, surveyors, lawyers, accountants, finance, nonprofits, filmmakers, musicians, artists and those that work at home. All partner programs include marketing and technical support. Model You act as a commissioned sales agent with set pricing and refer customers to us. We help them pick a plan and get started. You have a reseller account with a bucket of storage that you can markup, allocate and manage across multiple customers. You buy a large chunk of storage from us at wholesale prices and resell, allocate, and manage it across multiple accounts under your own brand. We host it or you host it. How It Works You create an account for each of your clients, they pick their plans and enter their payment information. You're responsible to manage the relationship with the client and to ensure the account is paid on time. When your clients pay their bills, a commission is set aside for 25% of the bill. You create an account for each of your clients, they pick a storage plan to suit their backup needs. You get to decide what their bill is going to be and clients are not required to enter their payment information as no invoice information is displayed in the client portal. This option is best for partners who offer multiple services to each client and prefer to generate one consolidated bill. When we bill you for all the managed service clients a commission of 25% is to be credited to the next bill. You purchase a large amount of bulk storage in the cloud. You create separate accounts for each customer—allocating a certain amount of storage for each—and set whether or not they are allowed to go over that storage limit, or if the backups stop when the fill their allocation. Then all of your clients’ data goes into your allocation. You’re billed for the entire allocation and get a report about each client’s usage for the billing period, that way you can decide what to bill your clients. Model You act as a commissioned sales agent with set pricing and refer customers to us. We help them pick a plan and get started. How It Works You create an account for each of your clients, they pick their plans and enter their payment information. You're responsible to manage the relationship with the client and to ensure the account is paid on time. When your clients pay their bills, a commission is set aside for 25% of the bill. Model You have a reseller account with a bucket of storage that you can markup, allocate and manage across multiple customers. How It Works You create an account for each of your clients, they pick a storage plan to suit their backup needs. You get to decide what their bill is going to be and clients are not required to enter their payment information as no invoice information is displayed in the client portal. This option is best for partners who offer multiple services to each client and prefer to generate one consolidated bill. When we bill you for all the managed service clients a commission of 25% is to be credited to the next bill. 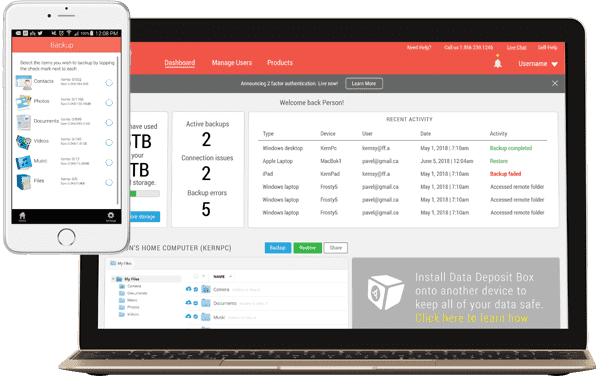 Model You buy a large chunk of storage from us at wholesale prices and resell, allocate, and manage it across multiple accounts under your own brand. We host it or you host it. How It Works You purchase a large amount of bulk storage in the cloud. You create separate accounts for each customer—allocating a certain amount of storage for each—and set whether or not they are allowed to go over that storage limit, or if the backups stop when the fill their allocation. Then all of your clients’ data goes into your allocation. You’re billed for the entire allocation and get a report about each client’s usage for the billing period, that way you can decide what to bill your clients.